Not eating a balanced diet full of fruits and vegetables can lead to a Vitamin C deficiency which affects gum health. Gingivitis is one of the leading causes of swollen gums, this is an early stage of gum disease and is caused by poor oral hygiene habits. External irritants, e.g. Switching to a new toothpaste or mouthwash, which contains abrasive or irritative ingredient(s). Taking a medication which has gum swelling as a side effect. No matter what the cause is, if you have swollen gums that last longer than a couple of days, you need to visit us and have your gums checked. The first aspect of treatment will involve examining your gum tissue to see if gum disease is the cause. If we feel you’re suffering from gingivitis, we will do a number of things including measuring the depth of your gum pockets and even taking x-rays to see if any bone loss has occurred. 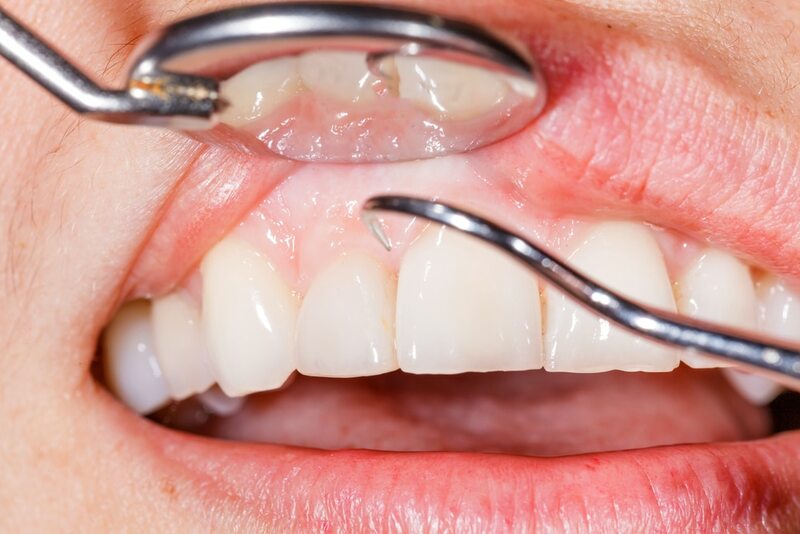 To treat gum disease, we must begin with a thorough scale and clean which removes all the plaque and calculus deposits around your gums and teeth, and which often causes irritation and swelling. We will also review your oral health routine, and ensure you’re brushing and flossing daily, and we may suggest you use an antiseptic mouthwash for a period of time to help ward-off infection. If you’re suffering from a severe form of gum disease, we will refer you to an expert periodontist that specialises in treating gum disease. Preventing gum disease is all about looking after yourself and your teeth. That means brushing twice a day, flossing daily and visiting a dentist at least every six months. You also need to lead a healthy lifestyle to look after your gums. That means focusing on whole foods, drinking plenty of water and avoiding sugary and acidic foods as much as possible. You also need to quit smoking and monitor your alcohol intake, as both of these habits have a negative impact on gum health. Most importantly, you need to monitor the health of your gums. If you notice any swelling or unusual bleeding, you should visit us as soon as possible. Minor irritation and gingivitis are relatively easy to treat, advanced gum disease is difficult and can result in extensive bone and tooth loss which requires costly cosmetic dental procedures.